For someone used to intensively travel at least 4 times the month, this spring went surprisingly quiet. After spending some good and travel-rich months in Israel, the return to Berlin and especially its short dark days did not make me feel too good. But once the first raw of lights lightened the grey sky, I gathered all my strength and went back on the road again. In the beginning, not too far away, only around two hours away from the city, at Elstal. 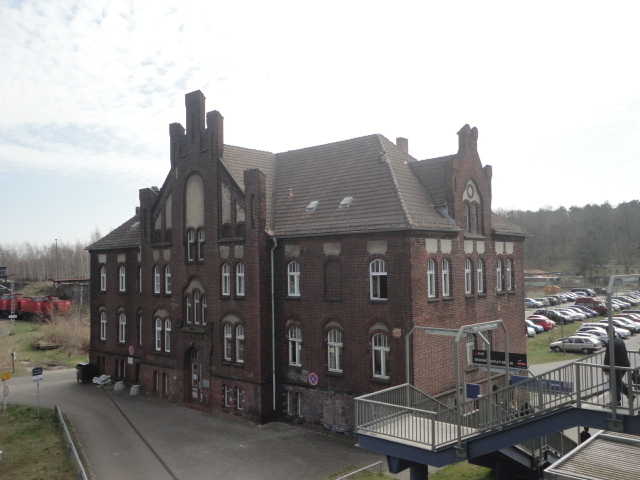 With my ABC ticket, I went first by bus - till the Tegeler Weg and from there by train till Elstal stop. The serious shoppers can find a better and comfier way, by booking directly the shuttle bus that goes directly from Ku'damm on the Outlet website. The offer is available on Fridays and Saturdays. If not so many people heading to the bus station leading to the shopping paradise, I would have think that I arrived in an abandoned place, as the train station was looking grey and not very welcoming. More action and colours - and a huge parking place - were waiting on the other side of the Brandenburg-styled massive entrance. 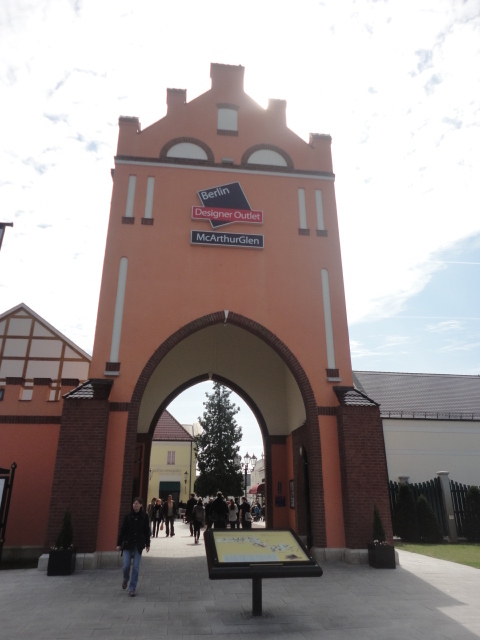 The outlet store is closed on most Sundays (it may sound unusual for anyone used with the intensive shopping programs, but Germans cherish their Sunday free day very much) and on Bank holidays, and open from Monday to Thursday from 10 am to 7 pm and Friday to Saturday from 10 am to 8 pm. 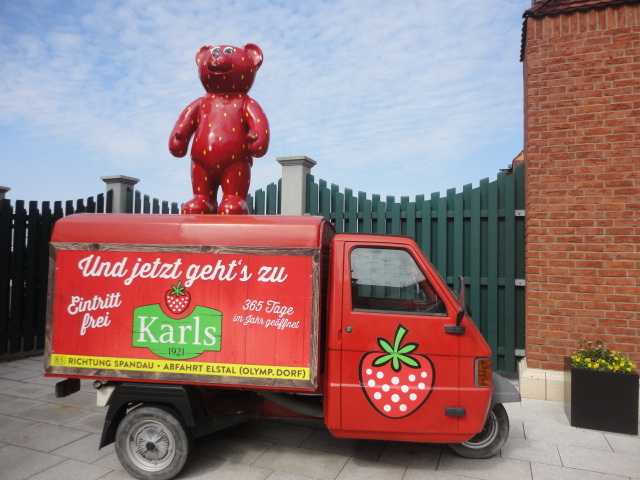 Because Elstal is mostly known as the best provider of strawberries for Berlin and Brandenburg, invitations to visit the famous farm cannot miss from this mini-shopping paradise. I plan to go there later in the day anyway but for now, let's look for some glamour. 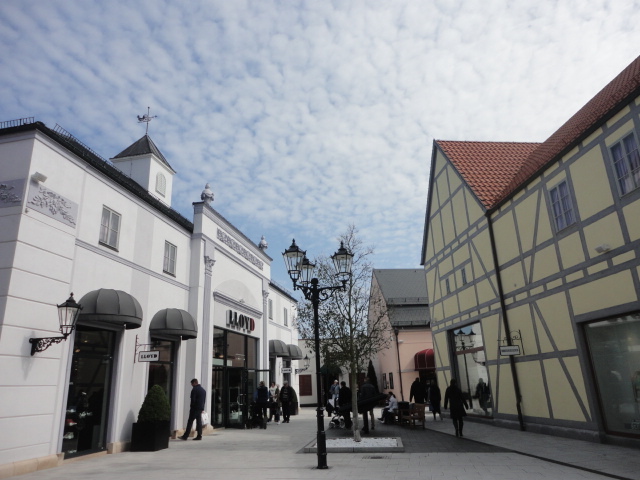 The outlet village as such looks like a small white-clean villate in Brandenburg. It is Friday afternoon, but the streets are not roaming with shopper as I encountered during my short stop to the Bicester Village two years ago. The discount season is not yet open, but there are some important offers, the most tempted for me being the one offered by Home&Cook. Overall, expect to find a moderate offer of brands - adidas, NOA NOA, Samsonite, Libeskind Berlin, Fossil, Desigual, True Religion, WMF, Escada. The visitors are relatively quiet and do shop modestly. Nike Factory seems to be a main destination for many tourists, at the moment, the busiest spot in the outlet, with customers chatting fast in Turkish, Russian or various Nordic languages. The foodie offer is limited, but in process of expanding, with a big Marche Superstore. 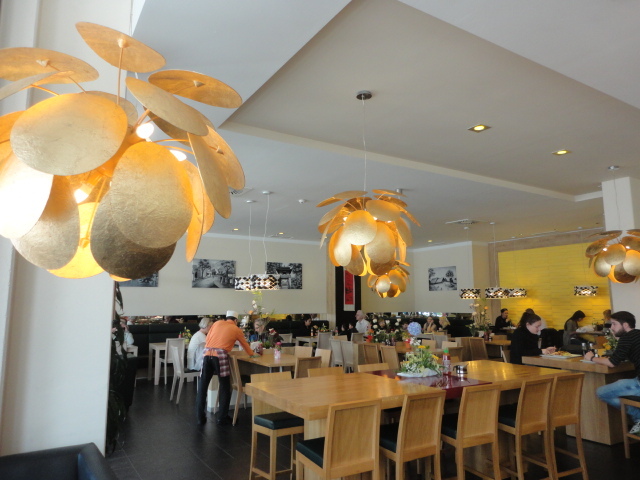 There is a big Asian flavoured buffet - elegantly designed - and a Nordsee restaurant, and many kiosks offering pancakes, traditional bretzel and beers. There is also a babysitting station, and little kids cars can be rented for 2 Euro the hour. The musical background echoing the entire village makes the visit special. 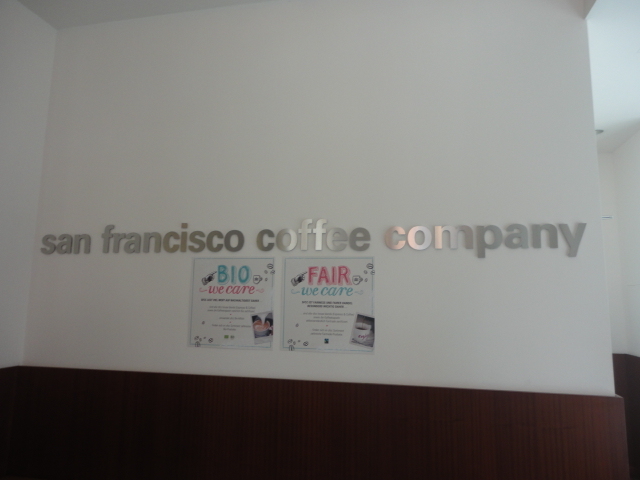 As for me, I rather prefer the company of the San Franscisco Coffee Company and its clean bio flavours. A bit surprising to find this genuine slice of America here, but I am satisfied with the offer of various muffins and flap jacks, plus the coffee flavours. Time is running fast, as usual, and I am decided to see the strawberry farm too. I am taking the regular bus back to the train station, waiting for my next connection in the opposite direction. 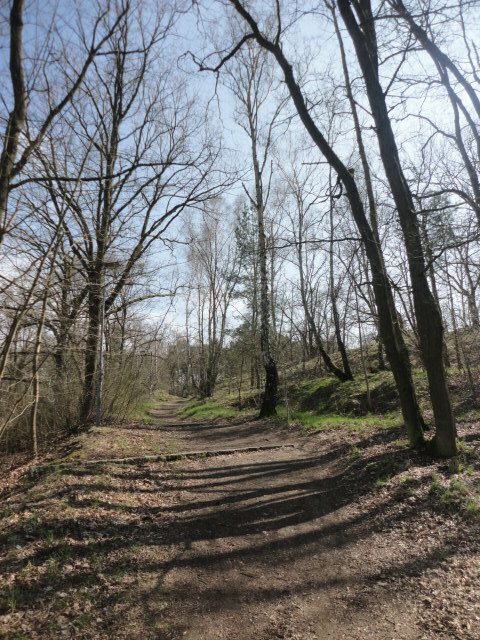 With some free time to wait, I adventure into a short spring walk into the forest around trying not to bother the many bikers enjoying the beginning of the summer on two rows. 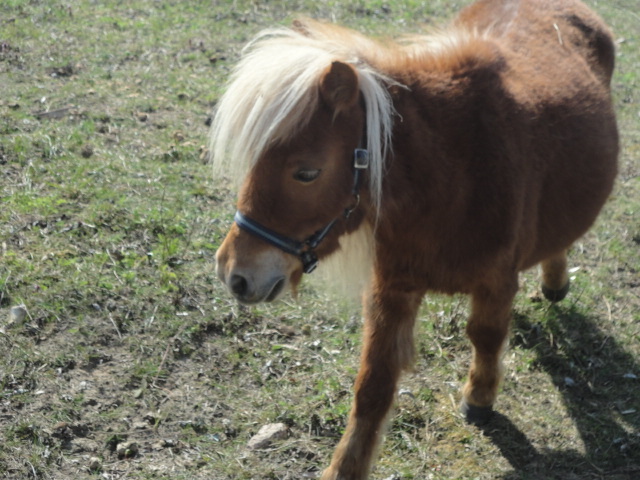 Near the farm, quiet little poney are having their outdoor lunch. 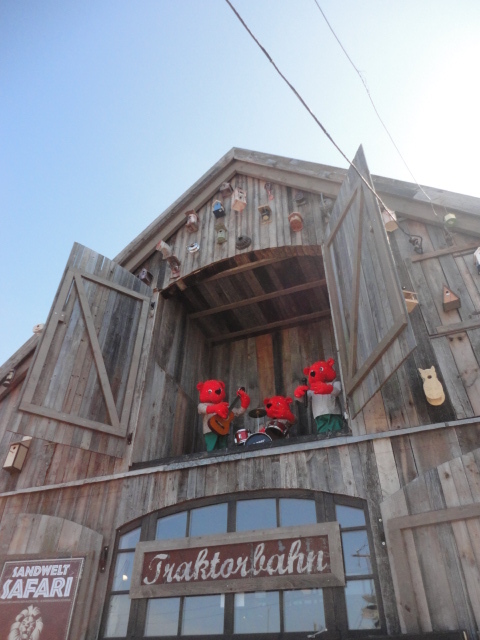 The Elstal Strawberry farm shows a busier side than the outlet. Parents with many kids and visitors from Berlin are coming here for some entertainment or fresh shopping. 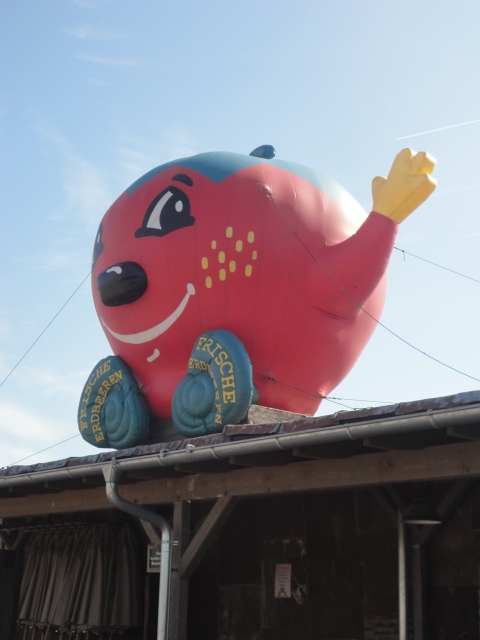 The strawberry season is not open yet, but there are enough attractions that may compensate this absence. 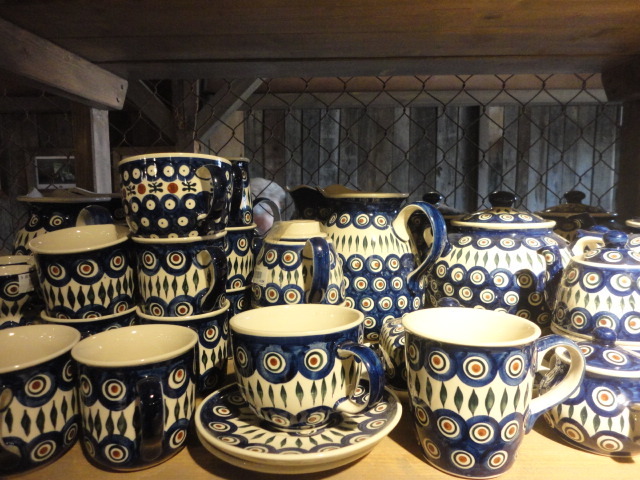 It was created in 1921, and it part of a larger network that includes locations in Rügen too. 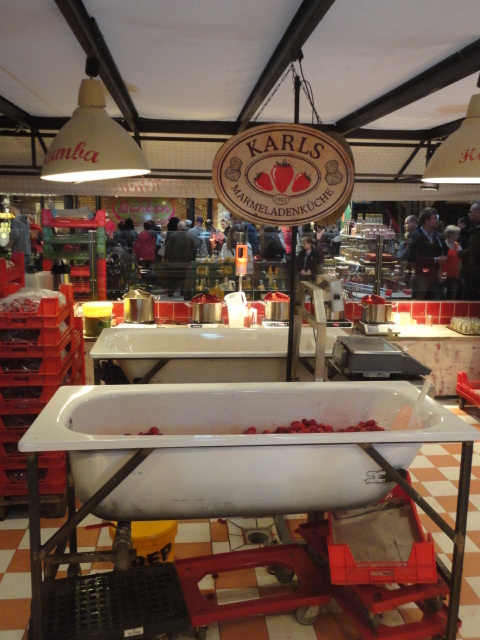 The good news is that the previous harvest was pretty good, as kilos of strawberries are waiting to be smashed into jam in huge bath tubes fixed on a red and white mosaique. 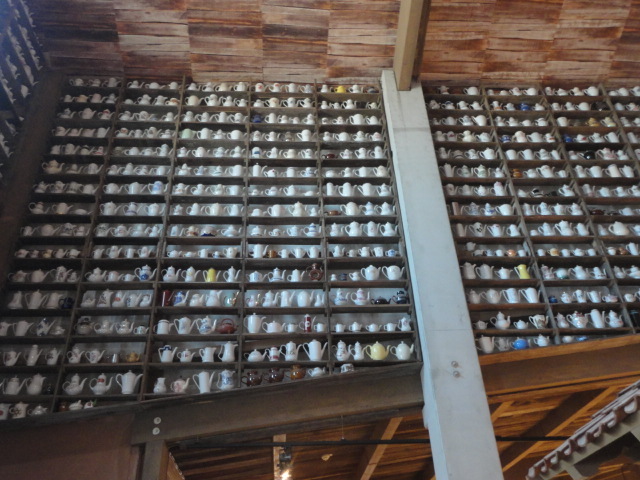 But although red and strawberry inspired products - from alcoholic drinks to various sweets and vinegar - there are also other interesting things to see around, such as the wooden shelves with cup teas and tea pots elegantly displayed till the end of the ceiling. Special porcelain specific for the Brandenburg area brings my mind back to reality, out of the pinky reddish bubble created by the intensive smell of strawberry marmalade in the making. Outside the darkish shopping entrance, there is more action and freedom. Everything seems to be tailored to make the children happy, from the truck carts, the little safari and the easy lessons teaching the kids how to make bread on stone (a skill that seems to be learned to German kids from an early age it seems). In another part of the small village, you can also start having your own taste of adventure and if you grew up without enjoying spectacular descents from the top of a hill, it is never too late to try it now. 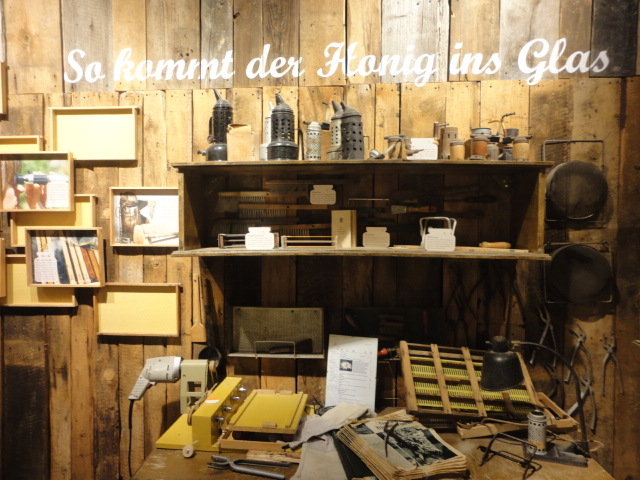 There are also small exhibitions, explaining how to make honey or labyrinths to put on trial your orientation skills. 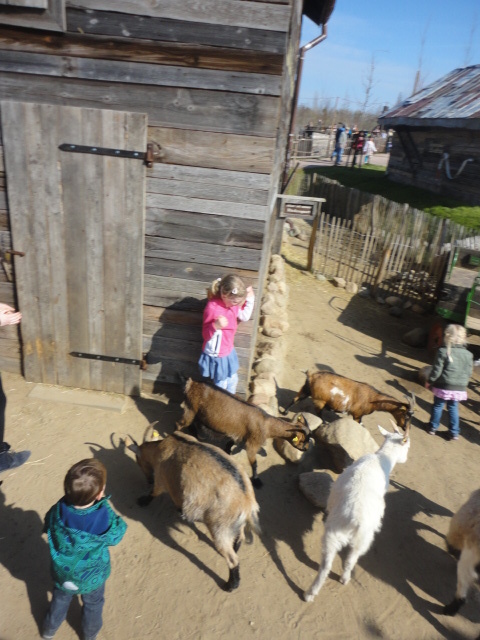 Most places are open for children birthdays celebrations and in most cases - if you ignore the intensive smell of cowshed - educational lessons about the life at the countryside are offered in a creative, non-intrusive way. As many of the kids will discover themselves, living in the middle of the nature, surrounded by various animals is not that easy, especially when stubborn goats seem to ask you something you don't understand. 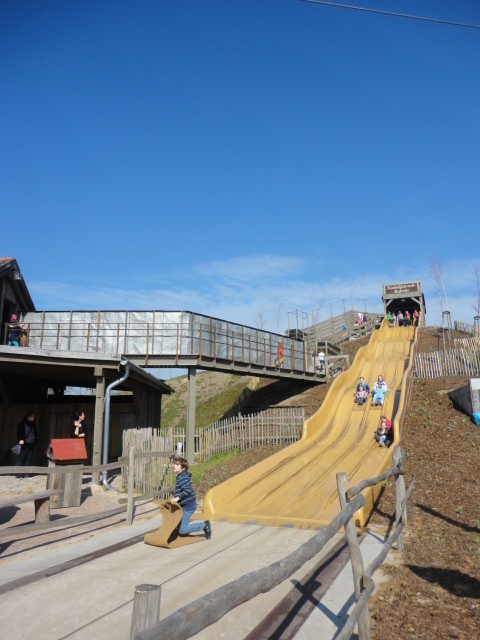 But, you can at least try to alternate between city parks and countryside adventures. Living in Berlin offers often such opportunities that I promise to consider more seriously in the next months.